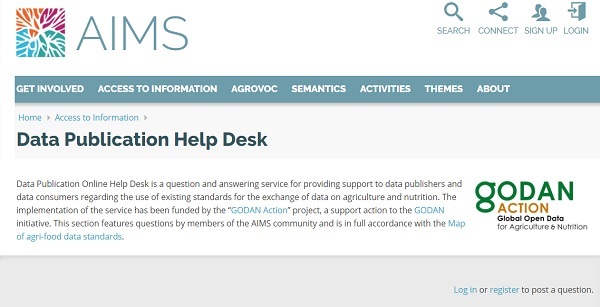 GODAN Action Partners, namely Food and Agriculture Organization (FAO) of the United Nations, Agroknow and Open Data Institute (ODI), have recently announced the Data Publication Online Helpdesk. The aim of this Question & Answer (Q&A) service is to provide support to data publishers and consumers on the use of existing standards for the exchange of data on agriculture and nutrition. At the centre of the helpdesk are the needs of end-users, which have been figured out in previous GODAN Action work on identifying gaps in data standards and recommendations for solutions. If you are a data publisher, data consumer, or a data standards author with a question about standards, you are invited to access the Data Publication Online Helpdesk and ask your question to the AIMS community, including the coordinators of the Map of standards, and the owners of the standards on which the questions may be asked. A registered on AIMS.FAO.ORG user is able to ask a question by completing the title of the question and the body of the question. The question can be related with a data standard and the list values of the data standards are connected with the online map of standards. Finally, each question can receive votes from the users regarding their usefulness. The user is able to answer a question that has been posted from another user. Additionally, the users are able to vote for the best answer to a question. The Data Publication Online Helpdesk will facilitate data publishers and data consumers, who struggle not just to identify relevant standards, but also find the supporting tools, documentation and guidance that supports use of the standard. Additionally, the Q&A service will contribute to the development of a forum through which new standards or extensions might be identified and it will contribute to the development of communities around standards to encourage adoption. The Q&A service was implemented following the principles of building on end-users’ needs and on what exists, as well as on ensuring the sustainability of the Q&A service. (d) search on the list of existing questions. It should be noted that questions that are posted to the Q&A service are linked with a data standard and the list values of the data standards that could be linked with each question is connected with the online map of standards. For more information on the map of agri-food data standards, the full accompanying report is available on F1000. The AIMS (Agricultural Information Management Standards) portal supports standards, technology and good practices for open access and open data in the agricultural domain. Its goal is to empower agricultural information management specialists all over the world in creating access to agricultural knowledge. AIMS is facilitated by Food and Agriculture Organization (FAO) of the United Nations and it includes around 2.700 members from all over the world.